Those survivors of Ukraine’s Holodomor, their photos featuring at the SpACE@Collins in Melbourne’s Collins Street, gaze at the audience with varying degrees of feeling, their craggy faces traced and filled by the wearing of age. These are the chronicles of tired flesh told. Russia is now every bit s dangerous as she was as The Soviet Union. Putin is having a bad time at the moment. The US imposed sanctions are hurting. Putin has been forced to cut pensions and adopt other unpopular policies. He is no longer as popular. Heaven only knows where it will all end. Well, he has find new ways to keep the millions flowing into his, and his rich mates, bank accounts. So, boo-hoo to Putin! My sympathies lie with the little people of Russia who have to survive under his regime. Russia is an example of how terrible political leadership can be. Our rabble and Trump are very mild in comparison. Millions of Ukrainians have died due to the deliberate actions of Russian and Soviet rulers, as well as millions of ethnic Russians and other minorities. May legitimate and effective democratic government develop in Russia, Ukraine ….. and Australia. But @Andreas, we have the ability to consign this present Australian group of self-serving, self-important puppets of executives of foreign owned multinational corporations, to the WPB of political history ….. the sooner the better. I read somewhere that Putin is worth around US$80 billion. Not bad for an ex-spy. Famine as a weapon is biblical in its intent. It has been deployed far too often. Look at its impact in Yemen and consider the starvation of the Irish. 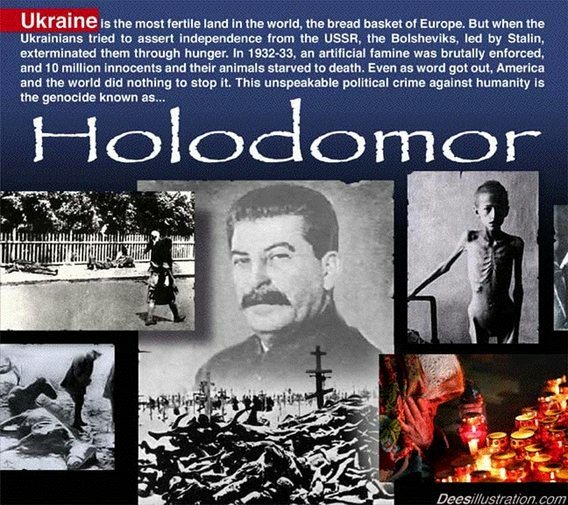 The Holomodor of Ukraine is up there with the genocide of the Armenians and Year Zero for Cambodia. I am not a religious person, but I shudder with the thought of the Four Horsemen of the Apocalypse: war, famine, pestilence and disease.